Dimensions 0.75 by 5 by 7 in. Coming home from the war in Iraq, US Army private Roy Scranton thought he'd left the world of strife behind. Then he watched as new calamities struck America, heralding a threat far more dangerous than ISIS or Al Qaeda: Hurricane Katrina, Superstorm Sandy, megadrought--the shock and awe of global warming. Our world is changing. Rising seas, spiking temperatures, and extreme weather imperil global infrastructure, crops, and water supplies. Conflict, famine, plagues, and riots menace from every quarter. From war-stricken Baghdad to the melting Arctic, human-caused climate change poses a danger not only to political and economic stability, but to civilization itself . . . and to what it means to be human. Our greatest enemy, it turns out, is ourselves. The warmer, wetter, more chaotic world we now live in--the Anthropocene--demands a radical new vision of human life. Plato argued that to philosophize is to learn to die. If thatâs true, says Scranton, then we have entered humanityâs most philosophical age--for this is precisely the problem of the Anthropocene. The trouble now is that we must learn to die not as individuals, but as a civilization. Roy Scranton has published in the New York Times, Wall Street Journal, Rolling Stone, Boston Review, and Theory and Event, and has been interviewed on NPR's Fresh Air, among other media. 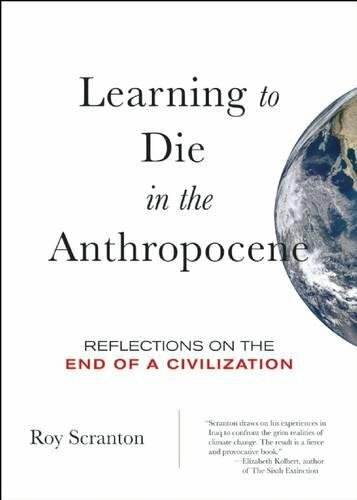 About: "In Learning to Die in the Anthropocene, Roy Scranton draws on his experiences in Iraq to confront the grim realities of climate change.